Joseph Denison wrote from Parkville, Missouri, to Isaac Goodnow, who was traveling . Denison reported that his solicitations for support of a college in Manhattan, Kansas Territory, had recently been well received. 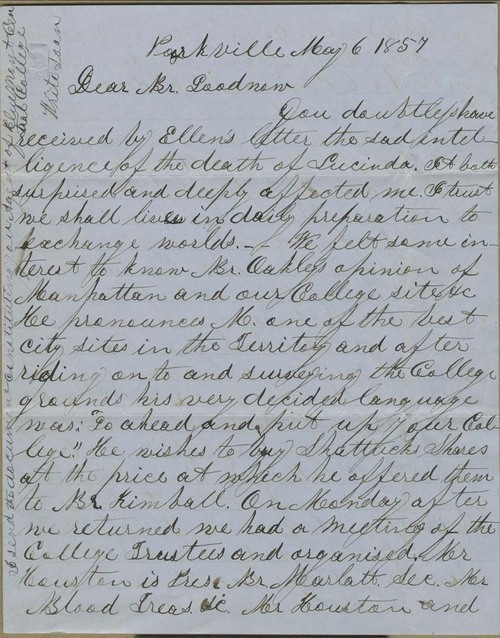 Among the interested parties were C. Evans and P. Judson of Evanstan, Illinois, who had been successful in building up Northwestern University in that area. Samuel Pomeroy also conveyed his interest, having pledged an investment to the cause on behalf of the New England Emigrant Aid Company.